Neighborhoods around Montmartre (8e, 9e, 18e), have many more laundromats/ laundrettes (laveries) than those in the very center of Paris. Visit the basilique du Sacré-Coeur while your wash sloshes! Northern Paris, the 8e, 9e and 18e arrondissements (map), is great for laundry because there are so many things to see and do while your clothes are washed. It's a district with many young families with children, meaning there's lots of laundry to do—voilà! Lots of laundromats! 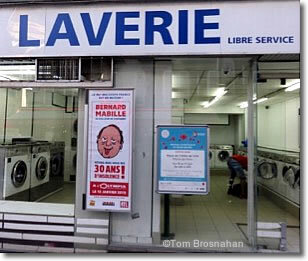 Paris laundromats/laundrettes tend to be open long hours, from 07:00 or 08:00 am to 21:00 (9 pm) or 22:00 (10 pm), seven days a week. Here's how to use them. Look at where you're staying in Paris. If you're near a Métro station on lines 2, 4, 12 or 13, you'll have easy access to the laundromats/ laundrettes mentioned below. You won't have to change trains to get to them. You needn't choose the closest laundromat (once you're on the Métro, it costs no more money and only a few minutes to go a few stations farther). Rather, choose one with things to see, or a park, or playground, or cafés nearby. Ride the Métro—and your laundry—to one of the Métro stations mentioned below, start the washing, and spend the waiting time visiting the basilique du Sacré-Coeur, admiring the panoramic view from the top of Montmartre, playing with your kids in a park, or enjoying a café. Several of the laundromats described below are in good restaurant areas, so you could plan to lunch while your clothes slosh. Locations on my map of Montmartre laundromats are arranged to match the list below, roughly from south (nearest the center of Paris) to north, scanning from west to east (map). —65 rue du faubourg Montmartre, between Chateaudun and Lamartine, west side of the street; Métro Line 12: Notre-Dame-de-Lorette. While your laundry is whirling, visit the Église de Notre-Dame-de-Lorette. —14 rue Manuel, on the north side of the street, east of rue des Martyrs; Métro Line 12: Notre-Dame-de-Lorette. —34 rue de Turin, off boul. Batignolles, half-way to place de Dublin, on the east side of the street. Métro Line 2 or 13: Place de Clichy. Every Saturday from 09:00 am to 14:00 (2 pm) an open-air organic food market (marché biologique) takes place on boulevard des Batignolles two blocks west of this laundromat. Bring a shopping bag! —5 rue de Calais, west of rue Blanche, south side of the street; Métro Lines 2 or 13: Place de Clichy, or Line 2: Blanche. Place Blanche, where you ascend from the Métro, is the location of the renowned Bal du Moulin Rouge nightclub. —28 rue de Douai, west of place André Breton, north side of the street; Métro Line 2: Blanche. Place André Breton has cafés good for a sit, a sip and a snack. —8 rue Fontaine, south of place André Breton, which has cafés; Métro Line 2 or 12: Pigalle. Good little Turkish restaurant for light meals nearby. —67 rue Condorcet, east of rue des Martyrs, on the south side of the street. Métro Line 2 or 12: Pigalle. There's a small kids' playground and cafés where rue des Martyrs, avenue Trudaine and rue Condorcet meet, just west of the laverie. —31 rue Lamartine, between rue Maubeuge and rue Milton. Métro Line 7 to Cadet or Line 12 to Notre-Dame-de-Lorette. —11 rue Condorcet, east of Rochecouart, west of Lentonnet, south side of the street. Métro Line 2: Anvers. There's a Paris Tourisme info office here. Walk up rue de Steinkerque for direct access to Montmartre by Funiculaire or stairs. 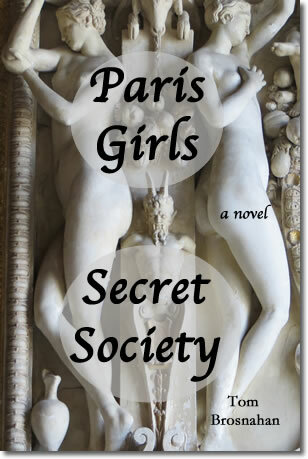 —22 rue des Dames, on the west side of rue Nollet, opposite Hotel Savoy; Métro Line 2 or 13: Place de Clichy. Many good small restaurants on rue des Dames. —14 rue des Dames, at rue Lemercier just east of Lemercier on north side of the street; Métro Line 2 or 13: Place de Clichy. Many good small restaurants on rue des Dames. —7 rue de Vintimille at Place Lili-Boulanger; Métro Line 2 or 13: Place de Clichy. —44 rue Veron, east off rue Lepic, north side of the street. Métro Line 2: Blanche, or Line 12: Abbesses. 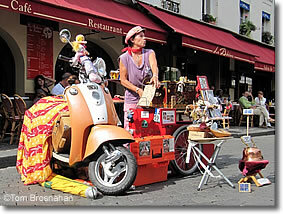 Rue Lepic has many food shops, traiteurs (prepared-food shops), cafés and restaurants, as does rue des Abbesses. —28 rue des Trois Frères, east of rue Drevet stairs, north side of st; Métro Line 12: Abbesses. A number of good restaurants along rue des Trois Frères (the three brothers no doubt run one of them...) Visit the unusual Art Nouveau Église de Saint-Jean de Montmartre at place des Abbesses. The Funiculaire du Montmartre is only two blocks east of the laverie. —63 rue Batignolles off place du Dr Felix Lobligeois, on the south side of street, east of the place; Métro Line 2: Rome, or Lines 2 or 13: Place de Clichy. Several good café-restaurants are in the small place; there are more to the northwest on the way to the large, pleasant, kid-friendly Square des Batignolles park. —17 avenue de Saint-Ouen, on the northwest side of the avenue, north of passage Saint-Michel; Métro Line 13, 13B: La Fourche. The avenue has lots of shops, cafés and restaurants. —46 avenue de Saint-Ouen at Villa Saint Michel, southeast corner; Métro Line 13, 13B: La Fourche. —151 rue Marcadet, between square Souplex, rue Duhesme and rue des Cottages, south side of rue Marcadet near the Comfort Hotel. The step-street of rue Fontaine du But ascends from square Souplex to Montmartre—easy access if you don't mind climbing stairs; Métro Line 12: Lamarck-Caulaincourt. The big park named square Léon Serpollet is hidden down a narrow alley leading north off rue Marcadet near the laverie. If you didn't know the park was there, you'd never notice it. —1 rue du Baigneur, just off rue Ramey, on the south side of the street; Métro Lines 4 or 12: Marcadet-Poisonniers, or Line 12: Jules-Joffrin. Three blocks north, at place Jules-Joffrin, is the northern terminus of the Montmartrobus, which will take you right to the top of Montmartre, the basilique du Sacré-Coeur, and place du Tertre. near Montmartre at 7 rue de Vintimille. place du Mont Cenis atop Montmartre. Go listen to her while your laundry sloshes!